Pro-Assad forces report slight gains in battles against rebel 'Army of Conquest', but Al Qaeda's Nusra Front denies Hezbollah gains. Syrian regime forces and Lebanon's Shia Islamist terrorist group Hezbollah seized control Thursday of several hilltops in a mountainous area that straddles the Syria-Lebanon border, a monitor said. 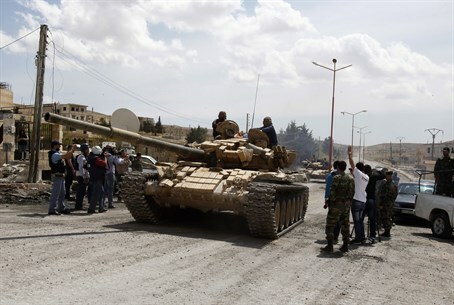 Pro-government forces have been battling rebel groups and Al Qaeda affiliate Al Nusra Front in the Qalamoun region, which lies north of Damascus and runs along the Lebanese border. A Syrian source on the ground told AFP Syrian troops "and allies" had advanced around Assal al-Ward, a small regime-controlled village near the Lebanese border, and that "dozens of terrorists" were killed. "Regime forces and Hezbollah seized control of a number of hilltops overlooking Assal al-Ward, after intense aerial shelling and attacks with Iranian-made weapons," Observatory head Rami Abdel Rahman said. He stressed that the battles "were being led by Hezbollah, with the participation of the Syrian army, notably the Republican Guard." On Tuesday, Hezbollah chief Hassan Nasrallah vowed to oust rebels from the Qalamoun region, saying the situation "needs radical treatment" but without saying when the assault would start. In April 2014, regime forces backed by Hezbollah took control of most of Qalamoun, but hundreds of rebel fighters remain entrenched in the mountainous region. Abdel Rahman told AFP that "what is taking place is a battle with slow advances, not a big military operation". A spokesman for Al Nusra told AFP that the Al Qaeda affiliate had not withdrawn from any areas in Qalamoun, and dismissed reports about advances by Hezbollah as "false". But he confirmed that battles were taking place around Assal al-Ward. Earlier this week, rebels in Qalamoun announced the creation of a local branch of the Army of Conquest, a rebel coalition including Al Nusra, which seized Idlib city in Syria's northwest on March 28 before going on to capture several additional, strategically-important positions.